Transfer News – 13th August, 2015 Edin Dzeko completes Roma loan move, Manchester United not keen on Nicolas Otamendi, Arsenal targeting Grzegorz Krychowiak. Everton sign Mason Holgate, Edin Dzeko completes Roma loan move, Manchester United not keen on Nicolas Otamendi, Arsenal targeting Grzegorz Krychowiak and much more in today’s transfer roundup. Manchester City forward Edin Dzeko has sealed his one year loan move to Italian outfit AS Roma, according to official reports. The 29-year-old who scored only four goals for the Citizens last term will have an option to make his move permanent next summer. Read More! Manchester United are not interested in signing Valencia centre-half Nicolas Otamendi, according to SkySports. The reports few days ago were claiming that the Red Devils are set to complete his move. However, Sky Sources believe that nothing is about to happen. Everton have signed defender Mason Holgate from Football League One side Barnsley on a long term contract. The 18-year-old Englishman passed the medical yesterday and was announced earlier today. 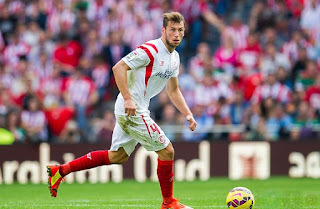 Arsenal manager Arsene Wenger is keeping tabs on Sevilla midfielder Grzegorz Krychowiak, according to ESPN. The Polishman has been on the Gunners' radar for the past several weeks. The reports further revealed that Arsenal’s scouts were present in the UEFA Super Cup game between Sevilla and Barcelona. Sunderland are planning to sign Liverpool bench warmer Fabio Borini, according to SkySports. The Italian who has already played a season on loan at the Stadium of Light could be heading this time on a permanent deal.